Sam Fankhouser, co-director of the Grantham Research Institute on Climate Change and the Environment at the London School of Economics, will be the keynote speaker of the "Power Generation and the Environment: Choices and Economic Trade-Offs" Symposium Oct. 1-2. Determining the economic and environmental "sweet spot" of power generation is the objective of "Power Generation & the Environment: Choices and Economic Trade-offs," a symposium hosted by the University of Wyoming Oct. 1-2. The symposium will focus on solutions to carbon dioxide emissions from coal-generated electricity; the economic implications of alternative control options; and the costs of alternatives to coal-fired generation. The symposium will bring together scholars and experts in energy economics, engineering and policy to discuss these topics. "The conference seeks to convene experts on the costs of controlling emissions from the electric power sector, which is a major market for Wyoming's coal and natural gas," says Tim Considine, a professor in UW's Department of Economics and Finance, who's chairing the symposium steering committee. There's no one solution to mitigating carbon emissions, says Nadia Kaliszewski, SER's energy outreach coordinator. For example, she raised the question of whether carbon sequestration, if environmentally and economically viable, could be combined with a hybrid system, such as natural gas and wind energy, as a means to control carbon output. "You may have to combine four, five or six technologies to make them economically viable and environmentally sound," she says. "Where is that ‘sweet spot?' Where is that balance?" 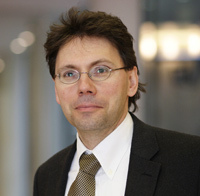 Samuel Fankhauser, co-director of the Grantham Research Institute on Climate Change and the Environment at the London School of Economics, will be the keynote speaker. Fankhauser also is a member of the UK Committee on Climate Change, an independent public body that advises the British government on its greenhouse gas targets. "Basically, I will try to show -- based primarily but not only on my UK experience -- that the rapid decarbonization of a modern economy is technologically and economically possible," says Fankhauser, who has tentatively titled his keynote, " A Practitioner's Guide to a Low-Carbon Economy." "The main challenges are political and policy related. Do we have the political will and policy competence to do this?" "Samuel Fankhauser is recognized as an expert on economics of carbon markets and climate change," Considine says. "His knowledge and expertise will prove invaluable as the conference grapples with the trade-offs and cost realities of controlling carbon and other emissions from electric-power generation." Paper and presentation proposals will be made by leading engineering and economic scholars, industry representatives and public policy makers from around the world who are conducting high-quality research. Topics can include cost and environmental performance of existing electric-power generation technologies; European experience with a CO2 cap-and-trade system; and the effectiveness of taxing vehicles based on expected carbon emissions and of rebates for low-carbon emission vehicles. "We've had some pretty high-caliber interest from renowned leaders in carbon mitigation and the electric power industry," Kaliszewski says. Thus far, abstracts and proposals have been submitted, among others, by academics from Yale and Harvard; the Brookings Institute and Resources for the Future, both based in Washington, D.C.; and the National University of Science and Technology in Islamabad, Pakistan. Paper and presentation proposals are due May 15. The symposium agenda will be posted when the registration period begins June 1.